It is used to remove vertical stripes caused by poor quality scanners. It works by adding a pattern that will interfere with the image, removing stripes if setting is good. This “negative” pattern is calculated from vertical elements of the image, so don't be surprised if you see stripes on the preview of an image that has none. And if pattern “strength”; is too high, your image will be striped. If, after a first pass, a stripe persists, rectangular-select it and apply filter again (all other selection type may worsen the result). You can find this filter through Filters → Enhance → Destripe…. If checked, parameter setting results are interactively displayed in preview. Scroll bars allow you to move around the image. 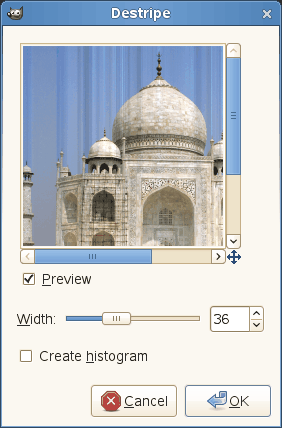 This “histogram ” is a black and white image showing the interference pattern more legibly. Slider and input box allow to set “strength” of filter (2-100): more than 60 is rarely necessary and may create artifacts.